A flotilla is a group of 10-12 yachts, guided by one of our lead boats, with a Skipper, Engineer and Hostess on board. On a flotilla holiday you can meander around the beautiful Greek Islands in the comfort of your own yacht, living the dream, without any previous sailing experience. How does a flotilla sailing holiday work? The flotilla usually consists of around 20-50 people depending on the size of boats and time of year. When you arrive you are given an initial briefing on the boat. On the first morning you will receive a comprehensive briefing that will cover all the working parts of the boat. This will cover elements from pulling the sails in and out (on our easy furling systems) to how to operate the all-important engine (which fortuitously keeps the beer in the fridge cold!). How much experience do I need to go on flotilla? Absolutely none at all...honestly. Our team in Greece are used to this and have a wealth of knowledge and experience to subtly assist and guide you through a fabulous week or fortnight of sailing. Every year we take thousands of people to the Greek Islands...some are sailors; some have never set foot on a yacht before in their lives. Many have since gone on to buy their own yachts and sail all over the world. The Ionian Islands offer an unbeatable playground for learning to sail. The combination of light winds, flat seas and crystal clear water proves to be timeless. If you are still feeling a little daunted following the initial briefing we are able to offer an ‘extra pair of hands’ for the first day, or two, or however long you need! This is just £80/€90 per day (plus his or her food & drink all payable locally). Many people enjoy the company of the extra pair of hands for a few days or the whole week, and others feel more than capable after just one day of training. Are all flotillas organised fun? Not at all. 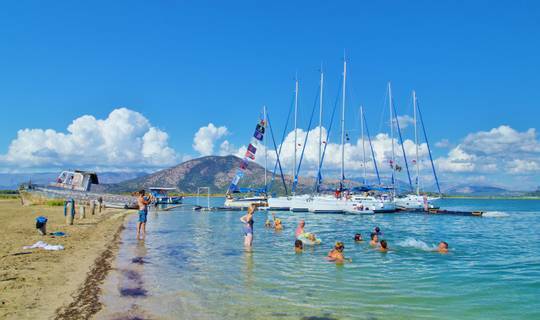 Ours are some of the most laid back flotilla holidays around. Throughout the week or fortnight the hostess will organise a few social events for you to meet your fellow sailors, such as group meals, punch parties or picnics. These are of course optional but can be a highlight for some! Either join your fellow sailors for drinks in the evening and enjoy comparing notes on that days events... or simply slope off and enjoy a quiet dinner with your friends and family. The choice is entirely yours! 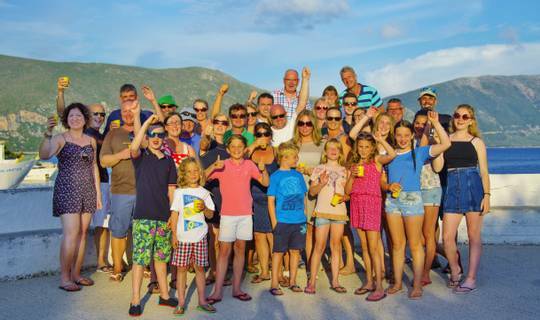 Who goes on a flotilla sailing holiday? Flotillas offer a uniquely laid back way to spend quality time with friends and family during the day, with the option to meet up with others in the evening. Throughout early (May and June) and late (September & October) season there tends to be mostly couples and groups of friends. During school holidays and half term weeks there are families on nearly every boat (apart from the odd teacher!). Know what you want, or just looking to find out some more information? Explore any of our flotilla sailing holidays, choose by your crew's level of sailing experience, your preferred area of Greece or the duration of holiday you are after. We currently hold 3 British Travel Awards for Best Family Holiday Company, Best Activity Holiday Company and Best Company for Customer Service!